The Turbo Dolphin is a kart found in Mario Kart Arcade GP DX. 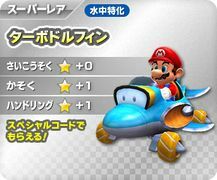 It is shaped like a Dolphin, and similar to the bike Dolphin Dasher from Mario Kart Wii. Its Type S alternate color is green and gray; Type X's color is red and blue. This page was last edited on March 6, 2018, at 19:00.